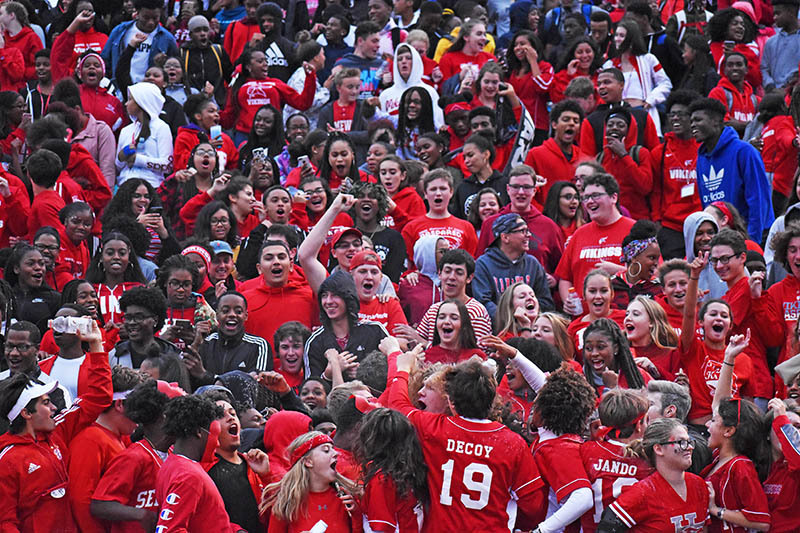 You may find your “pot of gold” in the first H-F community Queen of Hearts game. The prize is up to $10,100 and growing. Queen of Hearts raffles have taken off in other communities, and this first one here is picking up interest, said Terry Keigher, a member of the H-F Fine and Performing Arts Council, one of three organizations that will benefit from the game. In response to the overwhelming popularity of Queen of Hearts raffles, the Flossmoor village board is considering adjusting the scope of these types of fundraisers that would take place in town. 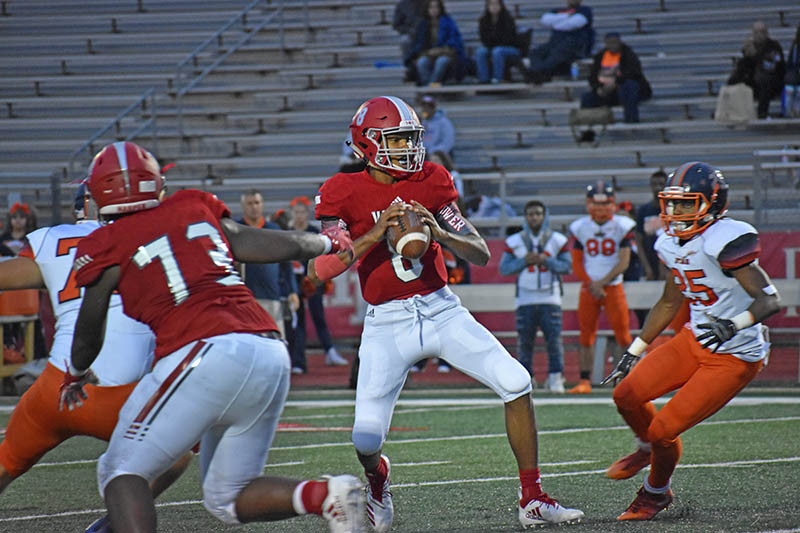 H-F quarterback Dominick Jones, No. 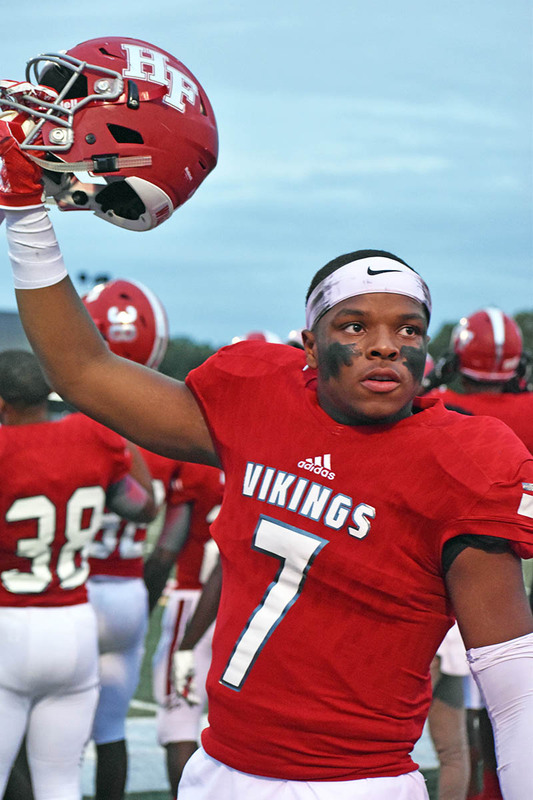 8, looks down field to see who he should throw the pass to during the Vikings' 2018 homecoming game. 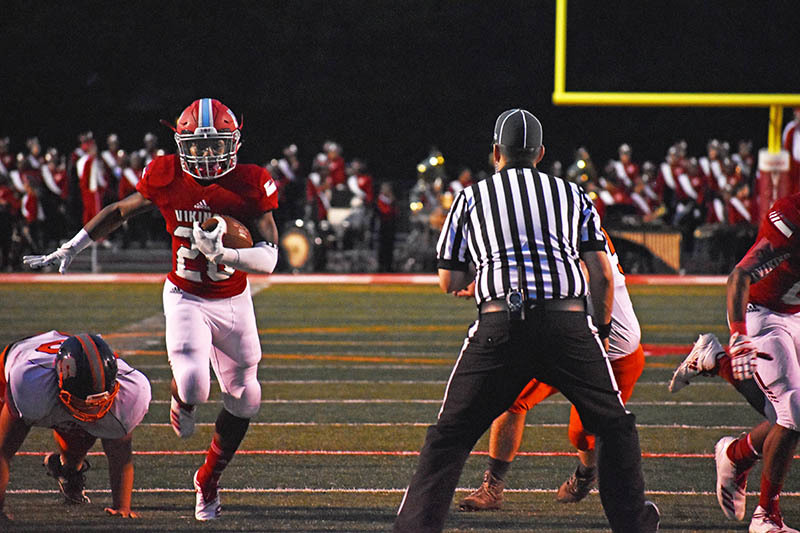 H-F running back Sean Allen, No. 20, breaks through the line during game action on Friday night against the Stagg High football team. Kelden McCall, No. 77, lifts up running back Sean Allen as they celebrate a touchdown during the Vikings' homecoming game on Friday. Vikings' Coach Craig Buzea cheers on the team during the homecoming game on Friday night. 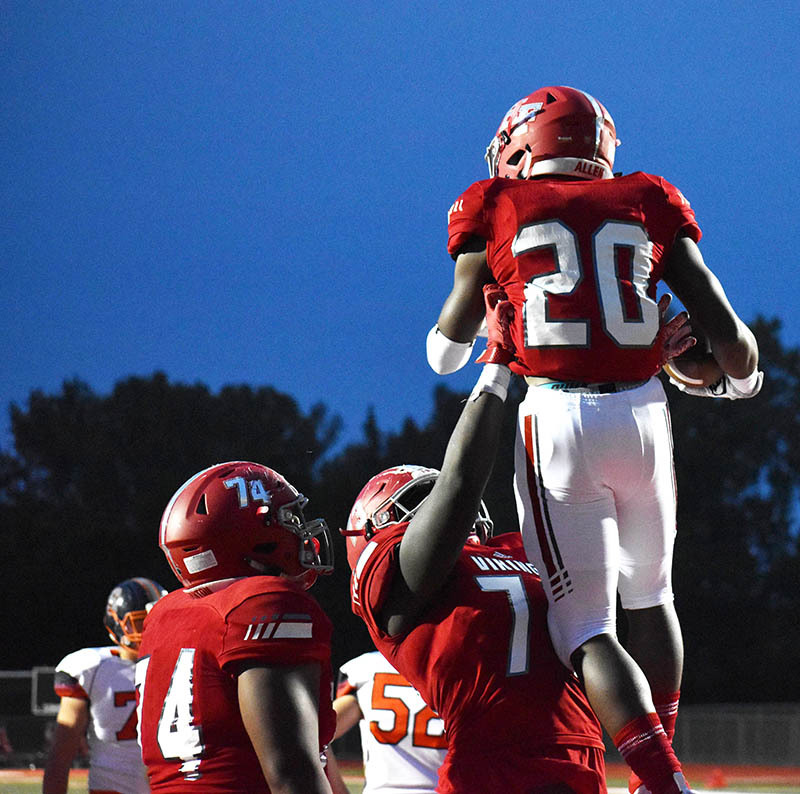 Kellen Williams lifts his helmet in celebration during the H-F High homecoming football game. 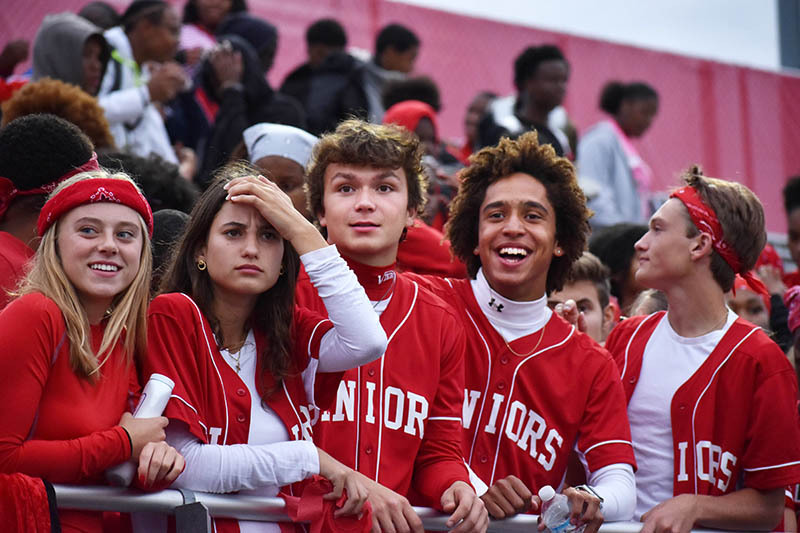 A large crowd was on hand for the homecoming game on Friday. Fans react to the game. 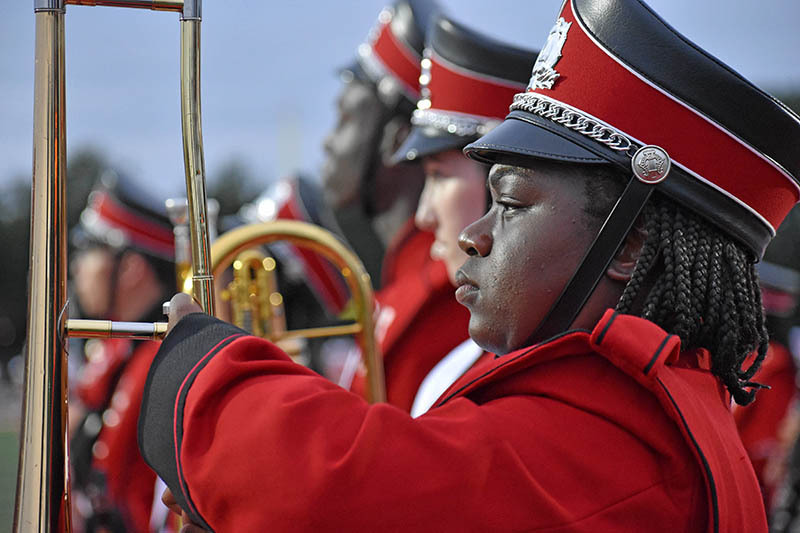 Danielle Johnson, of Homewood and a senior at H-F High, performs with the band before the homecoming game begins. 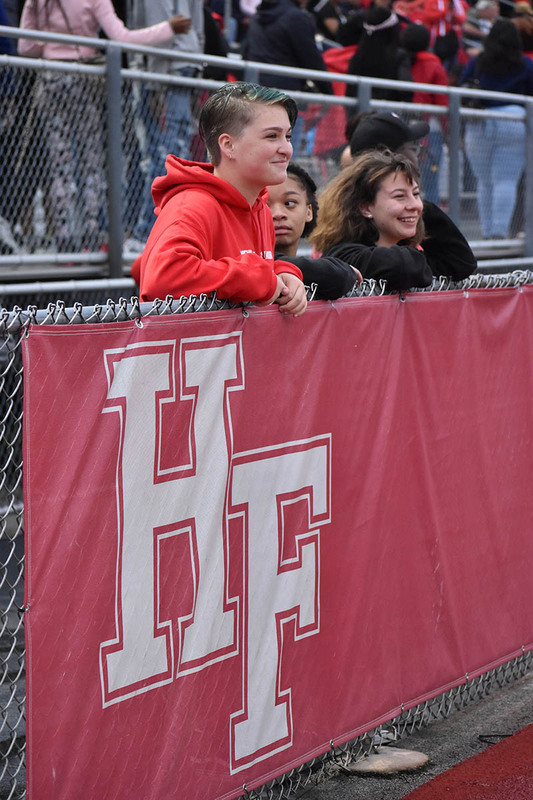 H-F High students, from left, Lily Denk of Homewood, Jade Griffin of Hazel Crest and Paige Porco of Homewood watch the football game on Friday night. 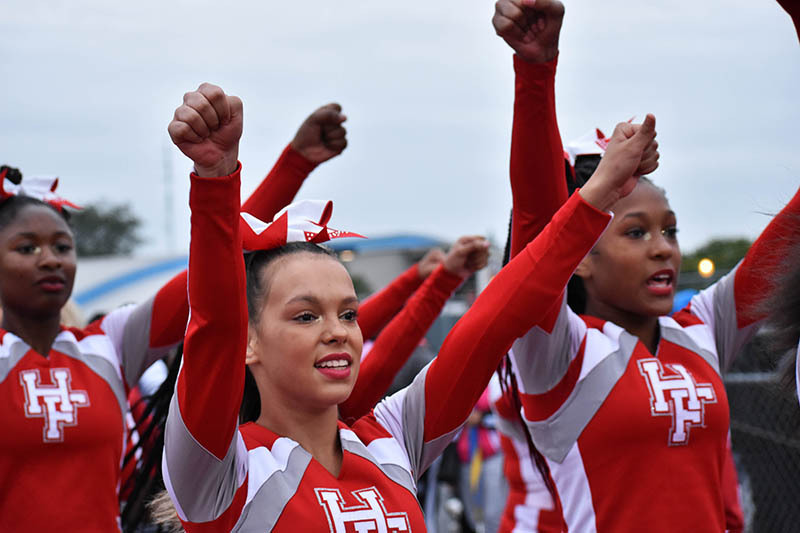 The H-F High dance team performs at the homecoming game. 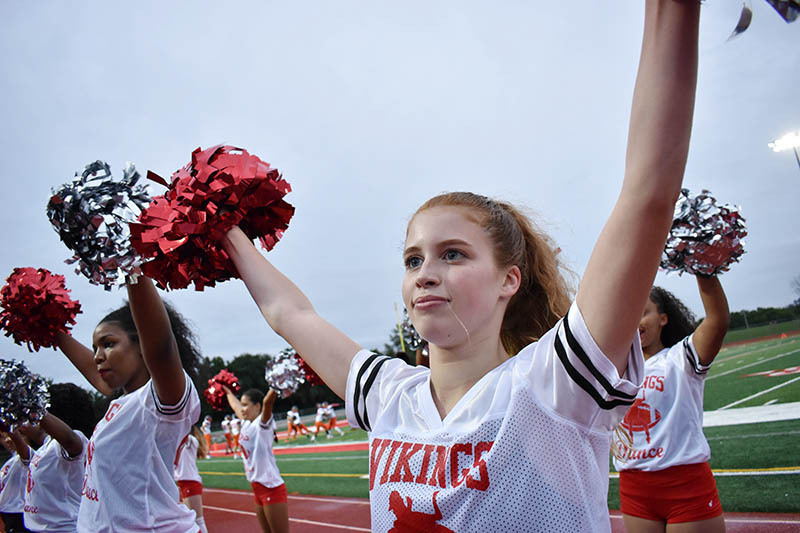 Viking cheerleaders perform during the homecoming game. 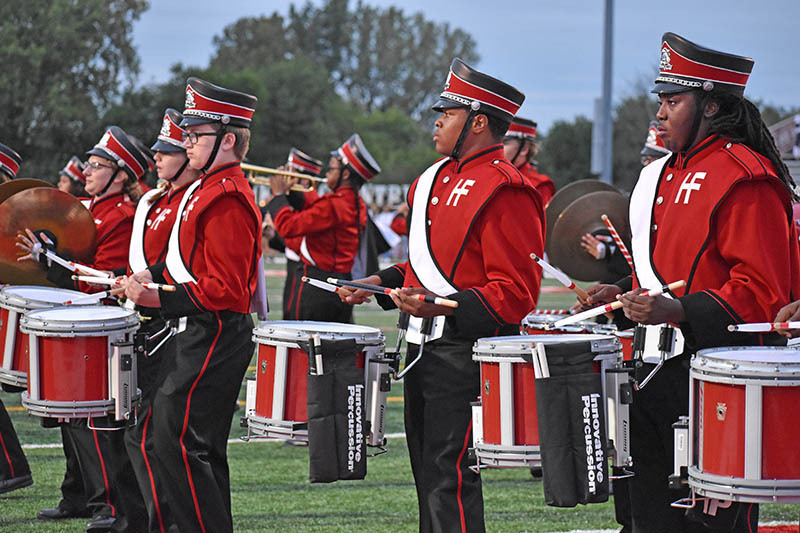 H-F High Marching Band member Abeni Lane prepares to perform with other band members during the homecoming game. The varsity pom squad performs at the homecoming game. 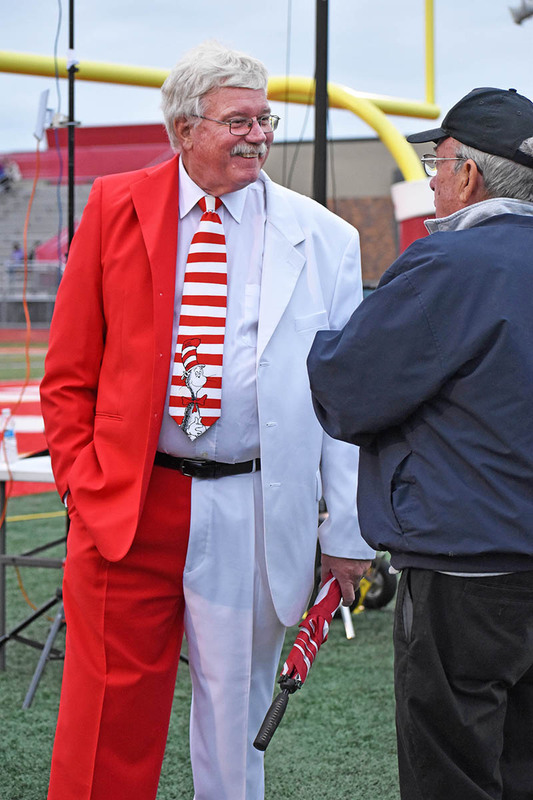 Dressed in his red & white HF suit, Andy Lindstrom from Homewood shows his support for H-F High during the homecoming football game. 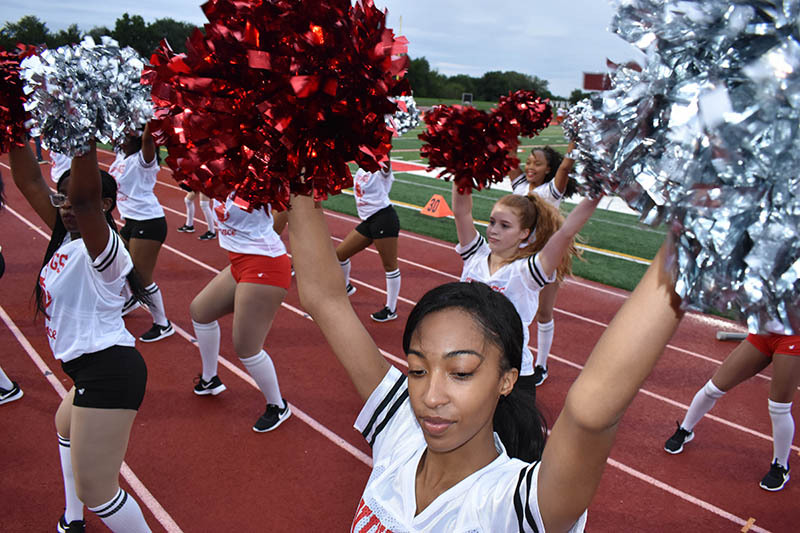 Homewood-Flossmoor High School students, alumni and community supporters had plenty to cheer about on Friday, Sept. 7, as the Vikings football team won the homecoming game 46-0. It was the third victory in the young season for the Vikings. 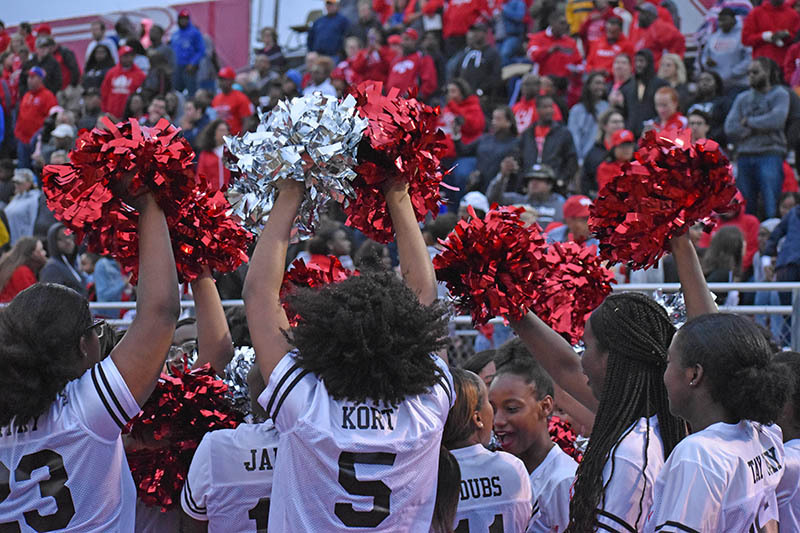 The team welcomed Stagg High School for the first of only four seasonal games to be played at H-F. The excitement of Queen of Hearts raffles that has spread through the Chicago area is now available in the Homewood-Flossmoor community. Will the winner be decided at the first drawing on Wednesday, Sept. 12? Organizers hope to keep the raffle going for the 120 days allowed by the license, but it is a game of chance so anyone could win at any time, said Terry Keigher, who is heading up the raffle committee. 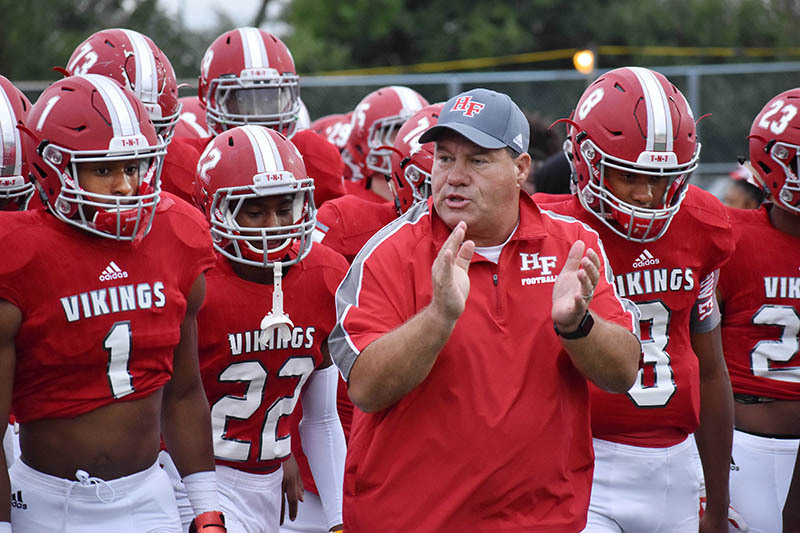 The Homewood-Flossmoor High School Foundation will host a golf outing and dinner and afterward join H-F supporters to celebrate H-F’s homecoming on Sept. 7. The golf outing is the major fundraiser for the foundation each year. In 2017-18, the foundation awarded $24,000 in grants to student organizations. 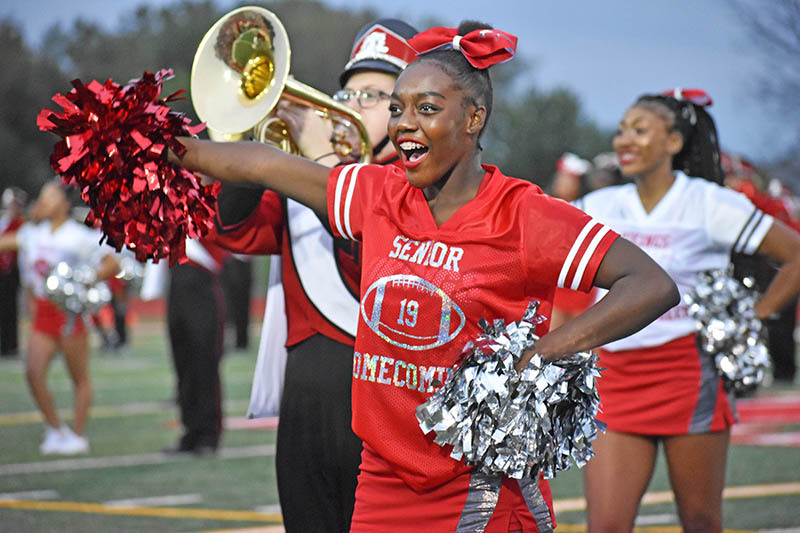 It’s a golf, dinner and the Homewood-Flossmoor High School homecoming football game extravaganza on Sept. 15 for the Homewood-Flossmoor High School Foundation’s annual fundraiser. 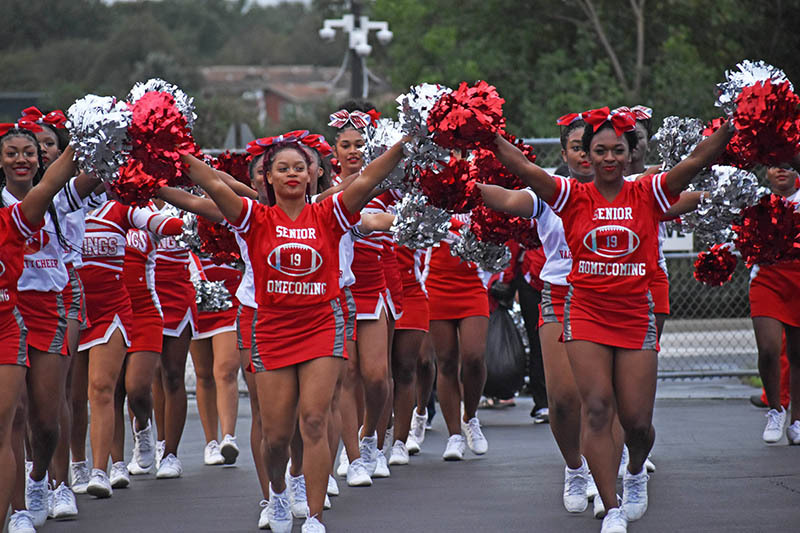 Money raised from the event supports activities and equipment for the high school’s various student organizations. In 2016-17, the foundation gave $20,000 in grants to support student trips and activities.